Children in the Reception class settle quickly and make good progress. Most pupils make good progress as they move through the school. Leaders make good use of information about pupils’ progress to quickly identify those who are falling behind and to make sure that they have effective extra help to catch up. Disabled pupils and those who have special educational needs receive similarly well- tailored support and do well. Behaviour is good because pupils are happy in school, enjoy working together and have positive relationships with the staff. Pupils have very positive attitudes to school and a good understanding of how to be effective learners. Parents confirm that their children feel safe in school and are confident that the staff will look after them. Governors, headteacher and teachers have made good improvements in pupils’ achievement and the quality of teaching since the previous inspection. The headteacher’s dynamic leadership has done much to turn the school around. She has the confidence of all who are involved in the life of the school. Pupils are taught in four classes. Reception children are taught as one year group. Other year groups are taught in three mixed-age classes: Years 1 and 2, Years 3 and 4, and Years 5 and 6. The school has only admitted pupils in Years 5 and 6 since 2012, so pupils took national tests in Year 6 for the first time in 2013. 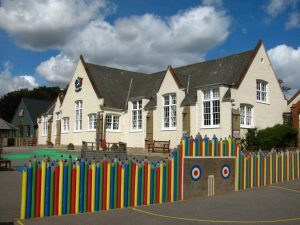 An independent play school is based on the school site and is inspected separately. The school has also been known as Aldeburgh National School and Aldeburgh Town School. The National School was erected in 1875 and supposedly catered for up to 130 boys, 130 girls and 200 infants. 1900: The average attendance was 120 boys, 120 girls and 120 infants. The Master was James Waskett, the Mistress was Miss E A Steward, and the Infants’ Mistress was Mrs M A Judd. 1912: The average attendance was 120 boys, 120 girls and 117 infants in 1912. The Master was Harry W Witham, the Mistress was Miss Alice E Steward, and the Infants’ Mistress was Mrs Charlotte E Sutton. Aldeburgh Primary School – 195? Back row (left to right): Peter Wright, Julie White, Patrick Brown, Judy Salmon, Lisa Nicholls, Sonia Jermy, Ann Marjoram, Trevor Knights and Martin Taylor. Middle row (left to right): Mark Oxborrow, Mark Stevens, Susan Maddocks, Leon Potter, Julie Brown, Marion Vincent ,?Unknown Boy?, Susan Owen , Paul Wright, Caroline Burrell and teacher Miss Stone. Front row (left to right): Janelle Block, Elaine Strowger, Lorraine Green, Beverley Smith, Elizabeth Cable, Stephen Brighton, Michael Tibbenham, Margaret McMullan and Marianne Keable.